The Red Turtle is a short (an hour twenty), slow, animation movie. The animation is on the artistic side (it often reminded me of Tintin comics), and is definitely a far cry from the majority of computer animated flicks that rule today’s world of animation. I'd use the word minimalism to describe it, though that is probably not the right word given the animation is often rich. 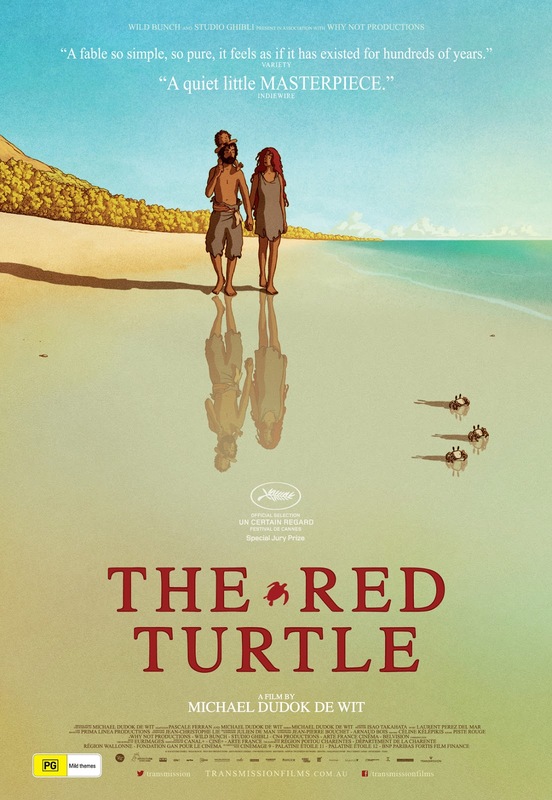 Most notably, though, the entire movie features exactly 0 spoken words; you certainly won’t require subtitles for this Red Turtle. You would notice I covered the movie plot in three sentences. That’s because what starts as a coherent "man stuck on island" Tom Hanks/Wilson like affair quickly deteriorates (in my opinion) into hallucinations and fantasy. Sure, there is no particular reason to see that as deterioration, but the end result is something one can read in too many ways for me to feel comfortable with. If pressed, I would argue The Red Turtle is an allegory on the human circle of life, with some obvious environmental and nature themes that tell us we are part of the natural world. By its very reductive nature (few characters, no words) the film is able to carry its symbolic message quite afar. 3 out of 5 crabs for this movie that is quite rich in crab characters, actually. Recommended to appreciators of fine animation, who would probably rate it much higher than I do. Definitely not recommended to those seeking exciting entertainment, though.